DruidShakespeare finally makes it to the capital having kept the Henriad away, and yes, the wait has been well worth it. Richard (Aaron Monaghan) has been sent into this world before his time, scarce half made up. And in a time of peace after the Wars of the Roses he embraces the role of villain. With gusto, informing us of his scheming before he undertakes each deceit. His machinations against his brother Clarence (Marty Rea) are only the beginning of an escalating palace intrigue that will undo Buckingham (Rory Nolan), Hastings (Garrett Lombard), Rivers (Peter Daly), Lady Anne (Siobhan Cullen), and the little Princes in the Tower (Zara Devlin, Siobhan Cullen again), before it brings back a time of war and undoes Richard himself. This is not a short production but its 150 minutes with interval gallops by so gripping does director Garry Hynes make the action. There are numerous moments throughout that change forever how you will read passages in the text. Whether it be Marty Rea’s incredible turn as Catesby, the fastidious assassin with his ritualised use of a captive bolt gun, or Garrett Lombard’s unexpected and sublime ‘Whoa’ worthy of Keanu Reeves as Hastings suddenly realises that the doors have shut, the extractor fan and fluorescent light has come on, and he’s the only one left on the stage along with Catesby – bogus. 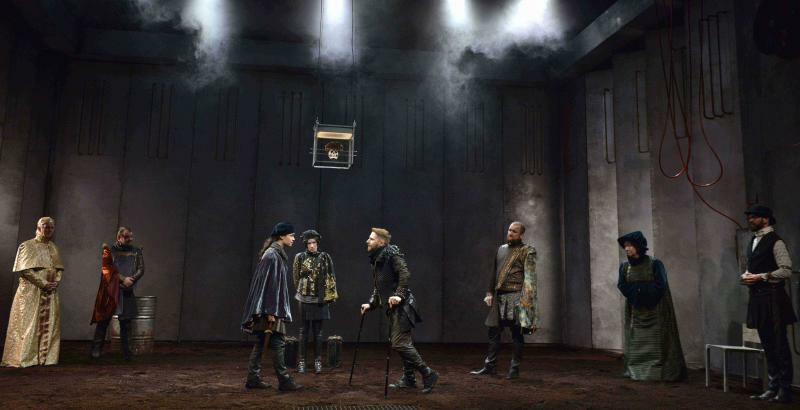 Richard III continues its run at the Abbey until the 27th of October. I attended Dancing at Lughnasa at the 2015 Dublin Theatre Festival mere days after the death of Brian Friel. That production served almost as a wake, and Graham Price and I mused then that Tom Murphy was now Ireland’s greatest living playwright. Alas, now he is taken from us too. I studied The Gigli Concert for my MA in Anglo-Irish Literature & Drama. I didn’t really get it, nor did I think that, despite patches of undoubted brilliance, it really worked overall. Only for Frank McGuinness to pronounce that often Murphy’s work didn’t read very well, it had to be performed to really come alive. I remember scratching my head at the time about that. My unspoken objection was: how would you ever know something was worth performing if you had to perform it first to see its quality? Frank McGuinness, of course, knew best. 2012 saw a feast of Murphy on the Dublin stage and I reviewed three of those productions here. First out of the blocks was Annabelle Comyn’s revival of The House, which dripped Chekhov, and a savagery in characterisation and theme when tackling emigration. 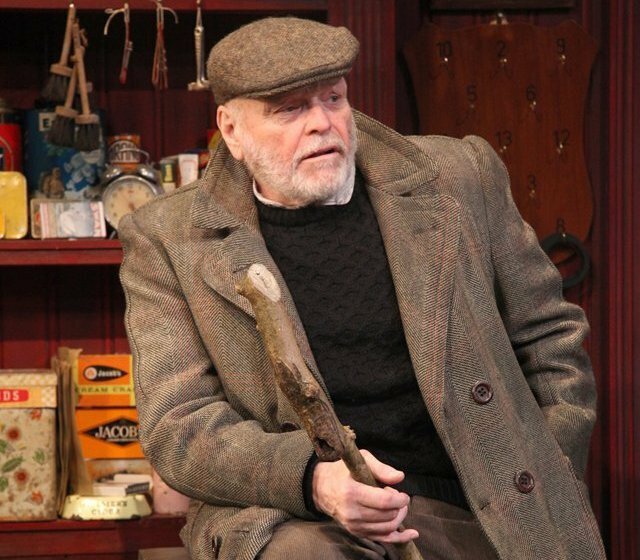 But savagery in Murphy hit its high water-mark at the very beginning with A Whistle in the Dark, which formed part of DruidMurphy’s repertory at the Dublin Theatre Festival. The primal violence of A Whistle in the Dark brutalised the Gaiety’s substantial capacity into a stunned silence. It still remains one of my most vivid theatrical memories. And then, in a marvel of repertory, the same cast turned their hands to the serious comedy Conversations on a Homecoming; with Rory Nolan and Garrett Lombard morphing from the two scariest brothers in Whistle to an amiable duffer and the village intellectual scrapper respectively. Druid returned to the Murphy well for a striking production of Bailegangaire a couple of years later. President Michael D Higgins was in attendance when I saw it with Graham Price and Tom Walker who summed it up perfectly as ‘Happy Days as Irish kitchen sink drama’. It is startling to think in retrospect that Murphy’s classic was packing out the Gaiety, when it represented such a collision of the avant-garde with the popular mainstream. When the Gate finally broke its duck and presented The Gigli Concert as its first foray into Murphy’s oeuvre the same thing happened: packed audiences, to the extent that the play was brought back for a second run. Graham Price reviewed it on the second run, to add a corrective to what he felt was my insufficiently admiring review from the first time round. I realised that it did work better in performance than it read, but still didn’t think it was the ne plus ultra of Irish drama. And then I ended my belated exploration of Murphy’s work where I began, with Annabelle Comyn directing on the Abbey stage in the summer. But The Wake was a very different proposition than The House. Comyn threw practically every Bat-tool in the director’s utility belt at it but Murphy’s rambling script proved ungovernable. But for all that there was still much brilliance shining thru the wreckage. Not bad for a play written in his early sixties. I have a personal hit-list of key Murphy plays left to see: A Crucial Week in the Life of a Grocer’s Assistant, The Morning after Optimism, and The Sanctuary Lamp. Now, whether anyone other than Druid will put them on in this current cultural climate is sadly quite another matter. 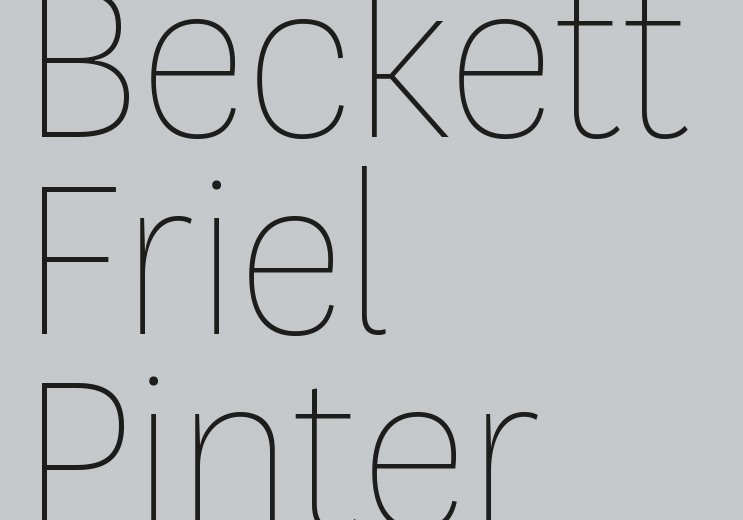 Artistic director Michael Colgan bade a sentimental (and almost self-parodic) farewell to the Gate Theatre with a festival of Beckett, Friel, and Pinter one-act plays. I’ve haven’t seen The Dumb Waiter since the UCD Dramsoc production directed by my friend Priscilla Ni Cheallaigh in 2000, starring Patrick Fitzgerald. Pinter done at anything but the right pace can drag to deathliness, even the Gate’s 2015 The Caretaker wobbled, but director Joe Dowling gets the pace here spot on; drawing out comedy. Cranitch’s raised eyebrows and shuffling newspaper at Lombard’s antics, including business with spare matches and shoes, bring out a level of slapstick that is amped up further when he starts howling “The larder is bare!” at the dumb waiter after they’ve loaded it with odds and ends of food. Oddly enough Cranitch and Lombard’s mania at satiating the unknown operator above actually reminded me of John Olohan and Eamon Morrissey’s ludicrous struggles with a mysterious telephone call in Druid’s 2010 production of The Silver Tassie. Dowling and set designer Francis O’Connor utilise the full space of the Gate to create as much distance as possible between Gus and Ben, and make the stage very spare; almost a visual equivalent of how silence lingers between them, pregnant with tension and absurdity dependent on how Pinter’s dots on the page work. And Lombard continues to show a real flair for delivering Pinter’s absurdist speeches. Joan O’Clery’s costumes look down-at-heel until they’ve properly dressed; but even still these two are more Harry Palmer than James Bond. For the first time, instead of thinking of these characters as hit-men out of Pulp Fiction, as was inevitable back in 2000, I wondered – what if they’re cleaners? What if they’re plugging MI5 leaks MI5 with extreme prejudice, taking out the Burgesses and Macleans of the world; morose from that squalid task. Lombard and Cranitch make a formidable double act, bringing Pinter’s early classic to humorous and doom-laden life. Oh, to see them as Mugsy and Stephen in Dealer’s Choice here. The Abbey, in its new baffling role of an Irish Wyndham’s Theatre, hosts Druid’s hit 2016 production of Samuel Beckett’s debut; and it’s incredibly impressive. Broken down gentlemen Vladimir (Marty Rea) and Estragon (Aaron Monaghan) find themselves in a desolate landscape, waiting beside a blasted tree for a meeting with possible benefactor Godot. Their attempts to pass the time; or hang themselves, whichever seems more practicable; are aided by the unexpected arrival of the pompous domineering Pozzo (Rory Nolan) and his silently suffering servant Lucky (Garrett Lombard). Vladimir is outraged by Pozzo’s treatment of Lucky, hauled about roughly on a leash, but Lucky’s speech soon puts paid to his sympathy… And then night falls and a small boy appears and tells them Godot will not be coming, but that he will certainly see them the next day; if they would be so good as to wait again. Which they obligingly do, not without grumbling at the futility of their lot; and then nothing happens, again. Waiting for Godot, like Hamlet, is a play full of quotes; especially if you’ve studied Irish literature. Yet for all our familiarity with this text, this production offers surprises. Director Garry Hynes slows proceedings down to allow Beckett’s comedy take centre stage, with Rea very deliberate over the care of his boots and hat; as proud of his meagre wardrobe as Chaplin’s Little Tramp. There is also some very funny business as three hats circulate with increasing rapidity and exasperation; Beckett as slapstick. Nolan unexpectedly plays Pozzo as first cousin to his Improbable Frequency John Betjeman, and it works incredibly well; the preening behaviour culminating in a self-tickled ‘Managed it again!’ to Rea, on sitting down again, which deservedly brought the house down. Lombard, meanwhile, stands up from his whimpering to achieve a career highlight: delivering Lucky’s insane, fast-paced monologue. Designer Francis O’Connor displays his recent fascination with presenting action within a monumental white frame having also used that motif for the Gate’s The Father. On the playing stage there is an artfully wretched tree, stones akin to a Zen garden’s denizens, and a comically wonderful moon that suddenly rises when night falls. Indeed James F. Ingalls’ lighting design not only casts the play into night in a manner that is both haunting and subdued, it also makes the very landscape of the set seem to change quality; a properly Zen effect. If Barry McGovern, Johnny Murphy, Stephen Brennan, and Alan Stanford, immortalised in Beckett on Film, represented a company personally endorsed by Beckett, then these Druid repertory players are affirmed by their own passion and soulfulness; Monaghan’s shattered vulnerability and anguish seems to physically embody post-war guilt and questioning. It is hard not to feel watching this production that something remarkable has happened before your eyes: the torch has passed triumphantly to a new generation of Irish actors. 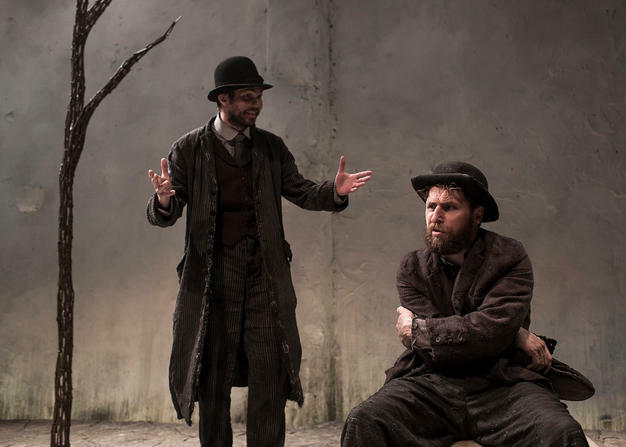 Waiting for Godot continues its run at the Abbey until the 20th of May. Gate regulars Marty Rea and Garrett Lombard are joined by Michael Feast for a rendition of Harold Pinter’s breakthrough play. An unnamed figure enters a ramshackle room and sits, looking around him with disfavour before leaving. Two other men then enter the room, one obviously proprietary towards it. And so begins the archetypal Pinterian battle for control of a space. Aston (Marty Rea) is the man at home in this disaster of a living space, who has, as a kindly gesture, invited in Michael Feast’s tramp Jenkins, or is it Davies? Davies is as garrulous as Aston is taciturn, and after some hesitation makes himself at home; even carping about the draught from a window next to the spare bed. But he soon finds himself left at a loss by the arrival of the first man we saw – Mick (Garrett Lombard), who actually owns this decrepit London house, is suspicious of Davies’s motives, and interrogates him with rapid-fire repeated questions. Director Toby Frow lets the action unfurl at slightly too slow a pace initially, but when Mick and Davies meet sparks begin to fly. Lombard is vividly vicious as the game-playing teddy-boy, his harassment of Davies pure Pinter. And that’s before he turns the tables on Davies later with a magnificently indignant and absurd riff on interior decorating. Feast is tremendously nimble as Davies. Wheedling, whining, conniving, charming, he contradicts himself on a sixpence if he thinks there might be advantage to it. And he suspects that there might be considerable advantage in driving a wedge between the two brothers. Mick owns the house, and Aston is meant to be restoring it, but he makes no progress, obsessing over tools. Aston offers Davies the job of caretaker, but Davies, anticipating Pinter’s 1963 screenplay The Servant, has his sights set higher. But in Pinter’s world, outlined by Davies in a speech about Aston, nothing is as it seems… Francis O’Connor’s set assembles a mighty amount of useful junk which Aston will never use, while rafters shoot out above the audience. Aston saved Davies from a cafe dust-up, but Davies is unnerved by Aston’s lengthy monologue about how his odd ideas got him electro-shock therapy. Now his broken gait keeps pace with his slow-moving ideas, and Mark Jonathan’s lights dim to just a spot on a mesmerising Rea as he trails away. Now all he has is an ambition to build a shed, which would be the starting point for restoring the house. But the grasping Davies is equally deluded; his refrain about his papers being in Sidcup, where he’ll never go, eventually renders Sidcup as illusory as Moscow in Three Sisters. Pinter’s landscape of overt menace and covert battles for dominance hidden in subtexts and non-sequitirs can be deathly when played too slow, but once they get going these three actors traverse that landscape artfully. The Caretaker continues its run at the Gate until the 21st of March. Oscar Wilde’s treatment of the related dangers of political corruption and the dangers of puritanical morality returns to the Gate under award-winning Ethan McSweeny’s direction. Wilde’s curtain almost divides drama and comedy. Robert wrestles with his conscience as the surprisingly wise Goring advocates that he confess to his wife and ‘fight the thing out’ with Cheveley, but Lady Chiltern’s most hysterically puritanical judgements come in this serious first half when she forces Robert to sacrifice his career by refusing to aid Mrs Cheveley, and he hates her for it; not least because she has made him such a moral ideal that he knows he’s already lost her by having done wrong years before he met her. After the curtain Wilde careens towards farce. Marty Rea Fassbenders mightly as Goring: he shrieks with surprise when his stealthy valet Phipps (Simon Coury) surprises him, turns his portrait to the wall after being unnerved by lines on its face, insists on a trivial buttonhole to make himself appear younger, desperately tries to read without glasses, and verbally fences with a sublime David Yelland as his comically disappointed father. Marion O’Dwyer matches Rea’s tour-de-force with her proto-Lady Bracknell turn as Lady Markby, while Siobhan Cullen’s Mabel is rendered as affected as her soul-mate Goring with her repeated posing to receive a proposal that Goring neglects to make. Under McSweeny’s direction Mrs Cheveley enjoys her dirty work more than I’ve seen before, and Aoibheann O’Hara’s breathy delivery emphasises the pleasure she takes in destroying Gertrude. Lady Chiltern and Robert are the most serious roles in the play, and. Peter O’Brien’s costumes provide Lombard with trappings of office that he wears with aplomb, and he makes Robert sympathetic thru a strangulated Etonian drawl that emphasises his politician’s social-climbing nature. Lorna Quinn makes Gertrude formidable in facing down Mrs Cheveley, but the script prevents her unbending nature being made sympathetic; perhaps why Wilde diverted her downfall toward mistaken identities and purloined letters. Francis O’Connor’s mobile door-frames allow us see the truth of scenes other characters only superficially observe and Wilde’s script similarly hides pragmatic profundities on morality and politics behind epigrams. 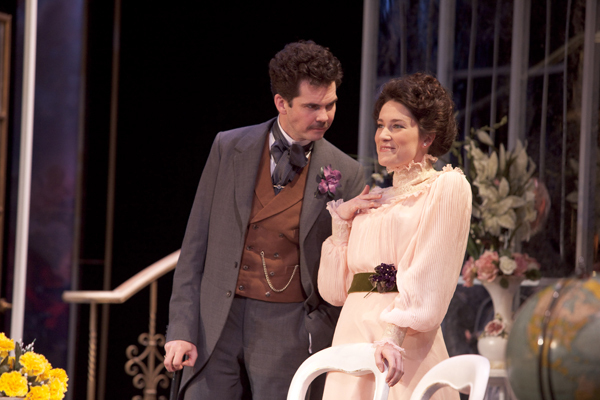 An Ideal Husband continues its run at the Gate Theatre until the 14th of June. Druid’s lightest outing of the Dublin Theatre Festival at the Gaiety saw their sterling ensemble assemble in a 1970s pub for Tom Murphy’s serious comedy about unsuccessful emigration, a tightly-knit group’s failed dreams, and the illusory promise of their mentor. 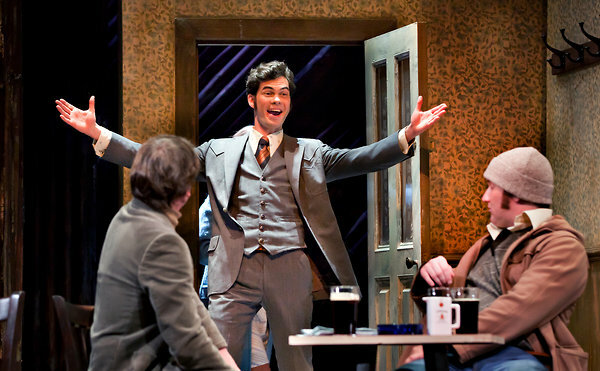 Michael (Marty Rea) has arrived home after 10 years in New York pursuing an acting career. He finds all his old cronies more or less stuck where they were. Tom (Garret Lombard) is still teaching at the local school, and still engaged to Peggy (Eileen Walsh), and showing about as much likelihood of moving on to the next step as Rory Nolan’s Junior is of finally getting his parents’ farm. The one person who seems to be going places is Liam (Aaron Monaghan), who seems to have absurdly as many jobs in the town as Kurt in Gilmore Girls. Michael is insistent that they can do all better if they remember the example of JJ, their mentor, who established this pub The White House with their help a decade before as a forum for ideas. Tom violently disagrees, disowning radicalism. It’s remarkable to see Nolan and Lombard who were terrifying as ignorant thugs in Whistle transform into an amiable old duffer and an intellectual scrapper respectively in this play. Rea is as reliable as ever, his half-romance with Beth Cooke’s barmaid Ann being nicely underplayed, and his sparring with Lombard on the merit of over-reaching ambition carries some nice emotional charge to go with the wonderful barbed insults flung about. Murphy’s play, performed without an interval, would please Aristotle in observing the classical unities but its night at the pub offers both insight and comedy under Garry Hynes’ direction. Druid stunned the brutalised Gaiety audience into silence at the Dublin Theatre Festival with Tom Murphy’s coruscating 1961 debut. Depicting violent Irish immigrants in Coventry trapped in self-mythologies of violence’s utility and “learning”’s futility it still packs an emotional sucker-punch. A Whistle in the Dark was infamously rejected by the Abbey because Ernest Blythe said no such people existed in Ireland, yet the novels of John McGahern attest to the baneful reality of monsters like Michael Senior (Niall Buggy), who arrives to visit with the youngest son Des (Gavin Drea). The battle of wills to mould Des’ future is an incredibly tense and bleak affair essentially pitting barbarity against civilisation. 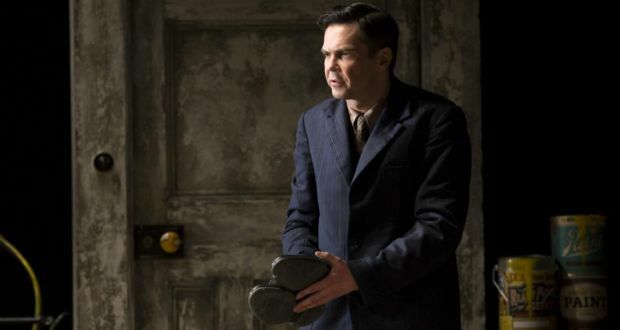 Nolan and Lombard are terrifying as primitive thugs, in their second outing as brothers after 2010’s Death of A Salesman, but while the ensemble was uniformly flawless Buggy’s self-pitying and savage turn as the patriarch must be singled out as being truly remarkable, while Rea was agonisingly sympathetic as the good man inexorably being dragged down to his father’s level. Garry Hynes’ direction rendered a realistic set a febrile battleground. Graham Price and I couldn’t help but note how indebted Pinter’s The Homecoming is to Murphy’s primal scream of familial power plays, but while both have the resonance of Greek myth this is not black comedy but darkest tragedy. Harris Yulin, familiar as a ‘That Guy’ from Looking for Richard, Buffy, and 24, gets a chance to shine in a lead role in this revival of Arthur Miller’s coruscating 1949 play. Salesman was a devastating response to people embracing the post-war boom by forgetting that the last boom, driven by cheap credit and property speculation, had produced the intractable Great Depression. The American Dream requires both such collective amnesia and a self-delusion that everyone can succeed in a system whose rules only allow some succeed. Such self-defeating dreaming is articulately skewered by Miller in the self-deceptions of the titular salesman Willie Loman. Talking of dreams – “Who let Ellen Page loose in here?” asked fellow Inception fan Stephen Errity (stephenerrity.wordpress.com) as we first noticed Michael Pavelka’s set, which tilts towards the audience from a height of a few feet, even as the facade of a hideous apartment building with a tree growing through it topples towards the actors. This set communicates Willie’s loosening grip on reality. His sons complain that he is talking to himself at night, but really he is talking to them, his reality is slipping from the present to events from years gone by. He interacts with teenaged versions of his sons in scenes which start purely in his mind and then explode into physical life with the help of quick costume and hair-style changes. Director David Esbjornson also skilfully employs the mobile props on the stage to slide between locations and temporalities. Willie raised his sons to believe they were leaders of men and he clings to delusions of his own importance despite being forced back on the road instead of receiving the office job he was promised for his trailblazing work for the firm as a younger man. Willie is a willing victim because he has been bewitched by the notion that everyone can end up like his brother Ben who boasts – “When I was 17 I walked into the jungle, and when I was 21 I walked out. And by God I was rich.” His implosion due to money worries, in particular a meltdown with his old boss’s feckless son, is incredibly raw as Yulin does justice to Miller’s script, which wraps an emotional knock-out punch around his politico-economic message. Willie’s disintegration is given its pathos by the effect it has on his family. Garrett Lombard as Willie’s eldest son Biff (an aimless self-loathing drifter), Rory Nolan as the younger Happy (mildly successful in business but insanely successful in womanising), and Deirdre Donnelly as long-suffering wife Linda, make you care intensely for their flawed characters and their various efforts to save their everyman patriarch, particularly a heart-rending restaurant scene where Biff attempts to lay bare the lies he and Willie have told themselves over the years. Lombard’s accent became pure mule during some tense scenes but that problem should disappear as the run continues, while in minor support the Gate ‘repertory’ enjoy themselves with Stephen Brennan’s luminous white-suited Ben out-Fassbendering Barry McGovern’s droll waiter and John Kavanagh’s Charley. Miller was sometimes criticised for letting his moral concerns trump naturalistic dialogue but this production is riveting theatre. Death of a Salesman runs at the Gate Theatre until September 25th.